Approval form only when applicable. person in charge of payment. We will contact you when the mice are ready. To request mice strains or frozen materials from the RIKEN BRC, please contact a customer service representative by e-mail ( animal@brc.riken.jp ) or by fax (+81-29-836-9010). Mouse strains are distributed as living mice. Frozen embryos and sperm are also available on request. The RIKEN BRC customarily supplies two or three breeding pairs. The center can accommodate requests for other combinations of up to five mice per request. Other quantities may be negotiated, depending on colony size and current demand at the time of request confirmation. 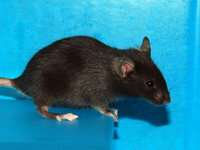 Live mouse Limited quantities of breeder mice (up to 3 males and 3 females or 6 mice) are available from a production colony. Two pairs or more are recommended to secure your establishment of the colony. Good breeder: Usually available to ship within 1 to 3 months. Slow breeder: Usually available to ship within 3 to 6 months. Approximate quantities: 20-30 embryos/vial. Usually available to ship within 1 month. Cryopreserved sperm 2 straws. Usually available to ship within 1 month. Recovered litters from cryopreserved embryos Limited quantities of breeder mice (recovered litter) are available from a cryoarchive. You will receive the resulting litter. The actual number of animals, the gender and genotype ratios will vary. Usually available to ship in 2 to 4 months. Recovered litters from cryopreserved sperm Limited quantities of breeder mice (recovered litter) are available from a cryoarchive. * : Please note that it may take more than 6 months to make arrangements to distribute. Our distribution fee is to partially recover production and ship costs and additional fee may be charged for any special handling or services. International shipping charges are payable on delivery. Fees to domestic users include consumption tax. The following fees are correct as of April 1, 2014 Price is subject to change without notice. Fees do not include the cost of shipping containers and freight, which will be separately charged. (*1) RIKEN BRC conducts routine microbe tests of animal facilities using test mice. If you request additional tests, extra fees are required. (*2) The cost of shipping containers and freight will be separately charged to a user. Microbe tests of foster mothers will be conducted and the cost of the tests will be also charged to the user. In addition, when you request a frozen resource from a FIMRe organization, you need to pay fees of the resource and shipping cost of dry shipper separately. (*3) You can order Mouse DNA from either the Experimental Animal Division or the Gene Engineering Division . Shipments will be made by the Gene Engineering Division. (*4) If you wish to request organs or tissues, please contact the Experimental Animal Division (animal@brc.riken.jp ). (*5) This refers to the use of our bioresource in research for not-for-profit academic purpose by a not-profit organization. Category I MTA is needed. (*6) This refers to the use of our bioresource in research for the following cases. Category II MTA is needed. For Mouse resources containing fluorescent proteins owned by, or licensed to, Clontech Laboratories, Inc., a license fee of JPY 8,250 is separately required per strain. For further information, please contact the Experimental Animal Division ( animal@brc.riken.jp ). 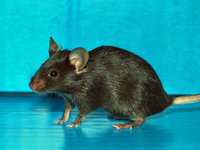 The mouse strains available from the RIKEN BRC are listed on the website and catalog. Users are required to complete the Order Form [Word] and Material Transfer Agreement for Distribution (Form C 1 ( Sample ) for not-profit or Form C_P 2 ( Sample ) for profit) and send these documents to the following address. Please use an appropriate category of Material Transfer Agreement (MTA). For not-for-profit academic research by not-for-profit organization. Some Biological Resources require an Approval Form ( Form D ) from the Depositor. For such mice, please fill in Form D and send it to the Depositor to obtain his or her permission. Upon receiving from the Depositor, submit the form to us together with Form B and Form C(Sample) or Form C_P(Sample). Depositors can be contacted at the addresses listed on the website and catalog of the RIKEN BRC. If you cannot find their name and address on the website or catalog, or if you have any questions, please contact us by e-mail or by fax. ① Mice undelivered, mice deceased or moribund on arrival, frozen embryos or sperm thawed on arrival, damaged container, etc. ② Failure to re-derive live mice from frozen embryos or sperm, genetic contamination, etc. ③ Unable to confirm the properties of the mouse strain described in the catalog, etc. If you experience such a case as stated above, please send your written notification or email to the Experimental Animal Division ( animal@brc.riken.jp ) by each deadline. If you report us a case of ①, ② or ③ before the designated deadline, we will replace the resource you order with the same or alternative strain one time only free of charge, issue credit (the right to request the same or an equivalent strain whenever necessary in future, if no strain is needed at the moment) or refund. Refund will not exceed the distribution fee. Shipping cost for replacement is to be covered by the user. There is no compensation for non-productive mice, mice younger than four-week old that arrive deceased or moribund, and pregnant mice that do not give birth. In the last two cases, resources are shipped at the user’s request. We do not compensate in case of failure or damage caused by the users. Upon receiving order from a user, we will start preparing the requested resource by required processes including re-deriving the mice from frozen embryos or sperm and/or propagating a stock. These preparations are very costly. When a user cancel the order as a matter of user’s convenience, the user will be charged for the costs we spend on preparation up until cancellation is notified (up to 100% of distribution fee). When cancellation is notified after the BRC sends out the resource, 100% of distribution fee plus shipping cost will be charged to the user. Whenever we note a quality defect in our resource, we will announce it through our website. We will also individually contact the users who received such a resource in the last 5 years. When you order the mice, please choose one of the following methods of payment listed below and send us your method of payment. We will send you an invoice and an appropriate instruction for each method as an attachment in PDF. Remit the charge to the following account. Any bank fees are to be covered by the payer. Mail us a bank check in Japanese yen, payable to ” The Institute of Physical and Chemical Research”, along with a copy of the invoice. Remit the charge to the account indicated below. Any bank fees are to be covered by the payer. Bank The Bank of Joyo, Ltd.
RIKEN is a non-profit organization and therefore requires all applicants to cover all bank charges, (including exchange, commission and handling fees) when sending payments for resources. We hope to share data obtained with the biological resources from RIKEN BRC. Therefore, please send us a reprint of any publication of which results arise from the use of our mice.